This year's walks will start at 10.30 a.m on Tuesday, 12th June. and Thursday 14th June. and last about an hour. 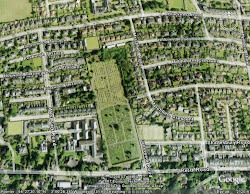 The first walk will be round the "old" lower portion of the cemetery and the second one will concentrate more on the late nineteenth and early twentieth century developments and plans for the future. The walks are free but numbers are restricted to around 20 this time.